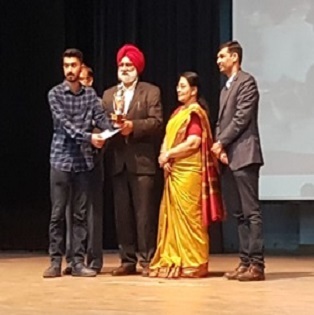 Our students from Computer Science & Engineering Department showcased their talent and innovation by bagging top positions in Inno-Tech exhibition 2019 (In Category-II Polytechnic College students) at Pushpa Gujral Science City, Kapurthala in collaboration with National Council of Science Museums, Kolkata. 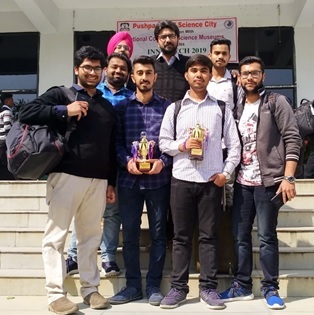 One team from mechatronics and one form Software category walk off with first position in their respective categories. J.A.R.V.I.S is an andro-humanoid robot which is designed to interact with humans. It has working robotic hand which can perform almost every function which a human hand can do. The robot gives its own introduction. The robot can move its arms and its base wheels with the help of Bluetooth connectivity with any smartphone having the J.A.R.V.I.S app. This project is based on idea that everything is connected to internet. Things can communicate with each other and thus real time exchange of data between them takes place. ESP 8266 , Arduino UNO , LCD , Prototyping Board , Jumper Wires , Servo motor, LED , Potentiometer were used to make it. Google assistant on our phone used to turn on and off the light, open-close gate, see farm’s temperature, humidity, soil moisture.